It's been an awesome summer, full of fun in the sun and family adventures, but unfortunately all good things must come to an end. Back to School is sneaking up on us once again, so to help make getting back into routine and back to the books a bit easier, we've created a helpful checklist. 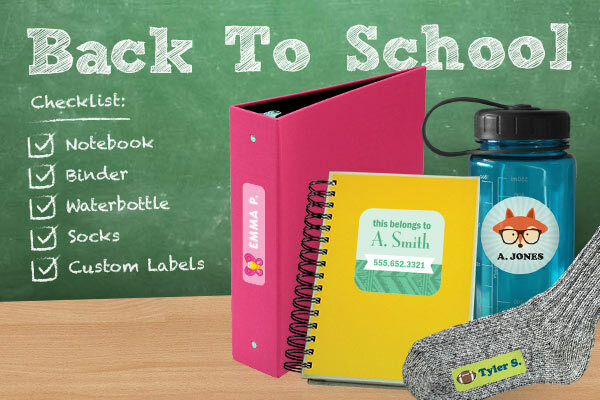 Lets get you and your kiddies organized and ready for a new year! - Back to school shopping. You're going to need book bags, running shoes, notebooks, pencil cases, and writing utensils and many more. In the spirit of the season, many stores are dropping their prices. RealSimple.com has complete list of all the essentials and where to buy so you come in under budget and on time. - Make some labels. After you've collected all the gear, you will want to stick on some names. Hop on your computer and go to StickerYou.com to create custom name labels for lunch bags, pencil cases and more. Its fast and easy and the labels will be shipped right to your door. You'll be the envy of other parents, AND all your kids' things will come home at the end of the day. - Restock the First Aid Kit. If you have young kids, you know what kinds of messes they get into. Good thing they bounce back quickly. After the summer its a good idea to replenish your first aid supplies so you'll be ready to tackle all of the bumps and scrapes gained during recess and gym class. Today'sParent.com has a great list of everything you need for your home First Aid Kit. - Set up the calendar. With class trips, baseball practice, meet the teacher nights, big presentations and the science fair, along with your own engagements, you're going to want to make sure you have some place to write it all down and keep it all straight. Download the Cozi App for your smart phone or tablet. It will help you keep each day of the week, and each child completely organized and on the right track. - Appointments. A new year, a new look and a fresh start. Just before the beginning of school is a great time to get a haircut, a dental check up and cleaning and refresh any immunizations your child may need so they will be all set for the next couple months. - Build the homework space. Clear off that desk or the end of the kitchen table, or wherever it is your child does homework so that its clean and ready to be used. Make sure there is sufficient light and restock on supplies. You can even hang handy charts ready for multiplication tables, alphabets and more. This article in SheKnows.com has a pile of great tips for creating a great homework spot. - Go grocery shopping. It's back to packing school lunches. With that said, take the opportunity of a new year to get creative with the noontime meal. Here are some easy and nutritious ideas by Spoonful.com that will help jazz up those lunch bags. Don't forget to make a shopping list for all these recipes. - Get organized. This may go hand in hand with some of the above listed items, but we've found that organized bedrooms really help start young ones off on the right foot. Throw out all the old used or ripped supplies from last year, sort all the clothes, clean out under the bed, and tidy it all up. You can create custom printed labels at StickerYou.com, perfect for organizing drawers and closets. There you have it parents! It pays to be prepared, even when you're not the one going back to school.